The room runs from 6pm - 11pm every Tuesday. 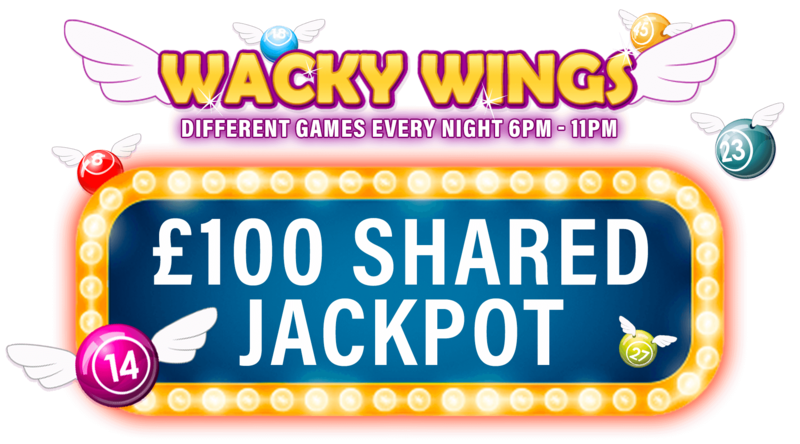 If anyone wins a Full House in 54 calls in Wacky Wings, everyone who has bought a ticket to the winning game wins a share of the £100 Cash Jackpot! PLUS, every prize pot is a guaranteed £40! The Tuesday Night Shared Jackpot will be awarded when any player wins a Full House in 54 calls or less during Tuesday night's game in Wacky Wings. The Jackpot Amount is £100 cash and will be shared evenly by every Funded Player who purchased at least one ticket to the game that corresponds with the winning Full House in 54 calls or less. Jackpot winnings will be credited within 24 hours. Jackpot prizes will be limited to the first 10 jackpot wins per player per night.